So, if you are feeling inspired to do more than just add a pop of colour, check out our stylish feature wall design ideas. Looking for more inspiration? Our design hub is a great starting point. A wall of exposed bricks has long been a seen as a holy grail of interiors, something that we are all desperate to have as a feature wall in our homes. For some lucky home owners stripping away old plaster will instantly reveal an expanse of beautiful brick, for others it’s more a fake until you will make it situation, with the help of wallpaper or brick slips. If you've revealed your bricks but are disappointed with the finish, you can draw attention to the wall by keeping the brick texture, but hide the mismatched or ugly colours with a freshly painted finish. Inspired? Use our guide to creating a feature wall with exposed bricks to achieve a similar look. Real exposed brick isn't a realistic option for everyone – particularly if you're renting or live in a new build – which is where stylish brick effect wallpaper or mural comes in. It's half the hassle, but achieves the same industrial feel that so many homeowners are after. Find a similar exposed brick wall mural at Wallsauce. Wall murals are definitely the new (more affordable) alternative to artwork. Why spend a fortune on an oversized piece of art when you could choose a print that covers an entire wall? We love the dark and moody vibes of the floral mural in this living room, you can find really similar prints at Surface View. Like the idea of murals, but not this mural? Check out our pick of the best mural design ideas for more inspiration. We know we said feature walls were no longer just about paint, but bear with. Colour blocking has been a major trend this year and adds a load more interest than just a wall of one block colour. We can’t get enough of this fresh white and blue combination – perfect for a fresh finish in a light-starved living space. There's plenty more inspiration over in our colour block paint ideas feature, too. Wall stickers may not seem like the most grown up solution for a feature wall, but we promise there are some really gorgeous designs out there. Plus if you are an interior design commitment-phobe or renting your place, they are a pretty easy to remove. Use one to make more of a focal wall – such as behind your sofa or at the head of your bed. Browse our pick of the best wall stickers if this idea has taken your fancy. We all love a house plant, so why limit yourself to just a single Monstera? Try adding plenty of plants to your shelves to create the look of a living wall or get yourself some hanging pots . Easy. 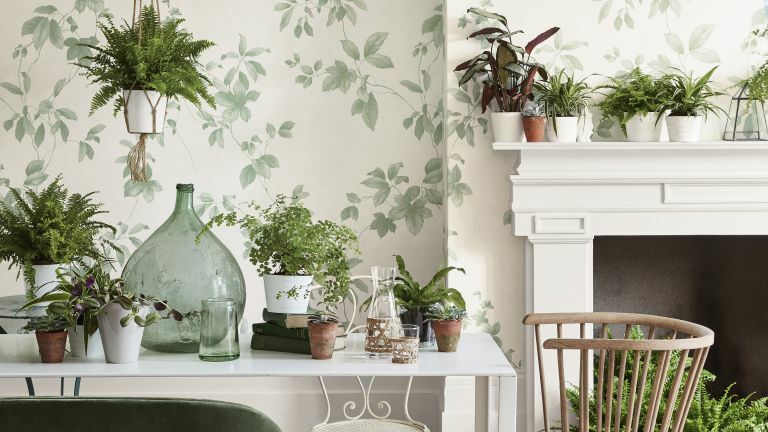 As well as visually refreshing a tired looking space, our house plant display ideas boast plenty of health benefits, too. Got an ever expanding collection of much-loved art, family photos or favourite postcards? Try grouping them together to create a gallery wall. If symmetry is your thing, measure them carefully before hanging to get even spacing. If you like a more laid back approach, just work out your arrangement on the floor first prior to picking up your hammer. Check out our tips for displaying pictures to get the best results first time. There's tons of ideas in our inspirational gallery walls ideas feature, too. It’s the oldest interior design trick in the book: a strategically placed mirror can make a room feel bigger. But rather than just hanging one large mirror, combine lots of mirrors in different shapes, sizes and styles to add extra interest. Find tips on recreating this look in our guide to how to display mirrors. Possibly even easier than just painting one wall, wallpaper is a super simple way to create a feature wall. If you are working with a small space or a narrow wall in a hallway, go for a large-scale, bold print, but keep the background light and bright. It would seem that the ombre effect is a trend that’s not going anywhere. It started on the catwalk, spread to our hair styles, and now the dip dye style has seeped into our homes. The best thing about an ombre wall? It’s actually super simple to do yourself, just check out our step-by-step guide to how to paint an ombre accent wall. Need more convincing? There's plenty more inspiration in our awesome ombre paint effect ideas. Putting up a few floating shelves is possibly the easiest and most inexpensive way to create a feature wall. Copy the look below and layer up your photos and knick knacks just as you would with a gallery wall, but unlike a gallery wall, you can constantly switch up your display. Decided this is the look for you? Browse our pick of the best floating shelves. Looking for more decorating or design ideas?